New research strongly suggests that the cyces of weather known as El Nino and La Nina are driven primarily by solar and space weather. In an update to a working paper published recently (link here), I present that the temperature shifts that trigger El Nino and La Nina years is now predictable with accuracy over many decades. 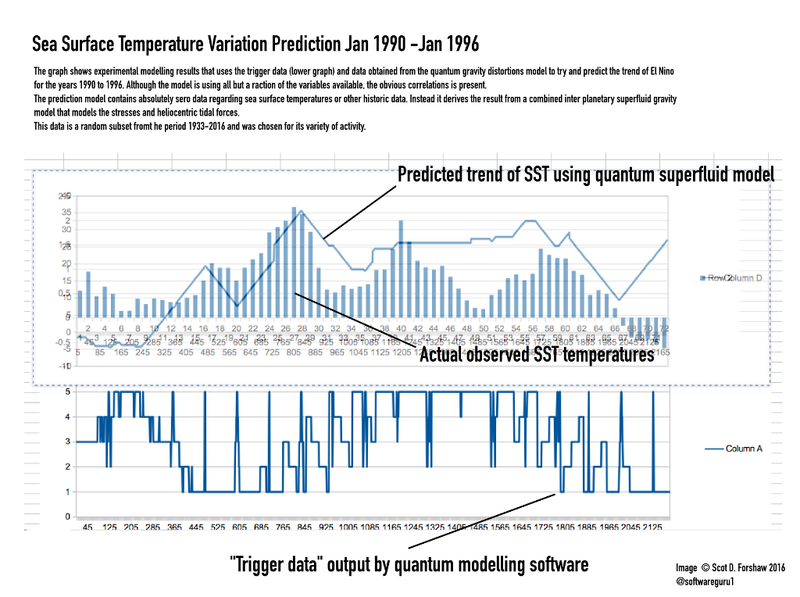 The image below which is a subset of the results from the modelling of theorised quantum distortions that drive solar activity are also linked with almost 100% accuracy to the rapid increase and descent of sea surface temperature (SST) anomalies. If this be the case, then the implication is that El Nino and La Nina are driven in the first instance by the Sun and the planets and NOT humans. This in not Climate Change Denial - just a denial that human activity can cause an entire ocean to heat up by 1.5 degrees in 30 days.. You would have to burn a piece of coal the size of the UK to do that. Whilst the effects of global warming induced by carbon emissions or that pollution and resource depletion is a serious "man made problem". The simple facts are that by and large, only the Sun has the ability to cause such massive disruption and change in so short a time frame. "regardless of our affect on the worlds climate, the solar system and the Sun at large dictate the mean parameters by which the global weather is governed"
Regardless of what earth centric climate models say, the fact remains we can now predict the dates of sea surface temperature anomalies without the need for "any past climate data" for over the last 80 years with a remarkable level of accuracy. That can only mean one thing ... "regardless of our affect on the worlds climate, the solar system and the Sun at large dictate the mean parameters by which the global weather is governed"
Illustration 8 below shows a plot of the Mean SST - Sea Surface Temperature for the period January 1990 to 1996. The model is trained to output a unidirectional signal 0-5 when a tidal anomaly is likely to occur. This daily data was graphed against the actual sea surface temperatures and strong signals indicating temperature deviations were examined. In all the period 1933 to 2016 was compared. The selection below was chose arbitrarily to demonstrate that SST is directly linked to solar and wider solar system disturbances. A significant problem is encountered by way of the already discussed inversion of direction, however using this model, 100% of El Nino years from 1990 to 2016 were predicted to the month. When interpreting the graphs in illustration 8, be aware that the “direction” of the lower trend is not indicative of “levels or direction of temperature change” but rather of the time period in which significant temperature changes take place or the current trend "inverts". A good example is at data point 66, where the SST goes from positive to negative, here the strong correlating spike in the lower graph that predicts an inversion or rapid change fromt he mean. This method was applied over very long periods and without exception out of many thousands of SST inversions and rapid changes the model predicted the change. A further edification of the data is that there were zero false triggers. 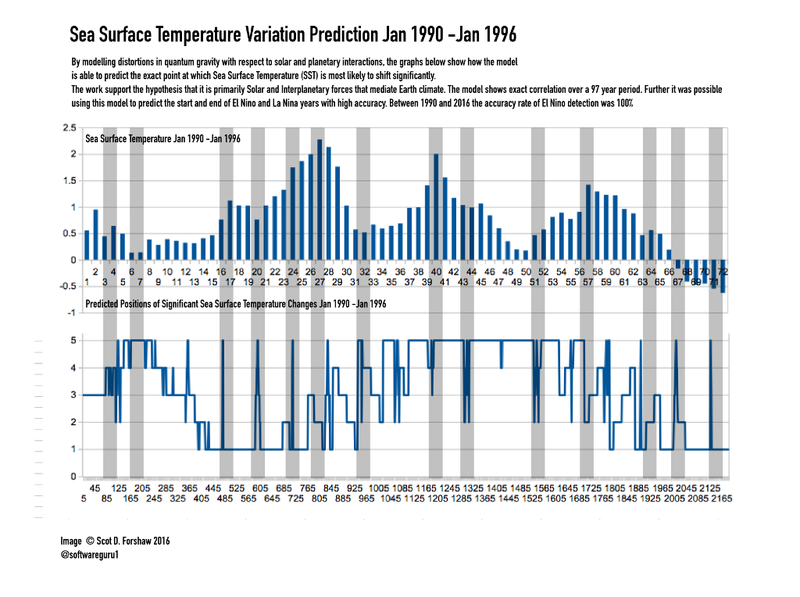 No changes were predicted between 1933 and 2016 that were not in line with the SST data. So sensitive is the model that a single average month drop of 0.2 degrees was predictable if it deviated from the mean. The image below is an experimental but "actual" output from the quantum model algorithms as the "trigger data" is analysed. Over the coming weeks it is expected that this will learn and refine to such an extent that a faithful plot is obtained for any chosen time frame. As the data now predicts the exact dates that SST changes, the research now focusses on determining the direction and intensity of the change. The best candidate at present is a link between SST and Neutrino detection rates at the Japan Neutrino Detector.